If you haven’t gotten your fill of science at the meeting, there’s more at the Fernbank Museum of Natural History. The museum strives to inspire life-long learning of natural history through dynamic programming and interactive science displays. 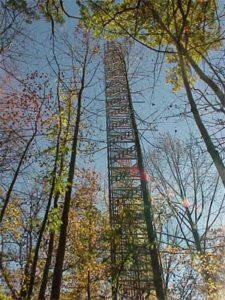 The forest tower at Fernbank Science Center is festooned with meteorological instruments, contributing to the WeatherBug network. Along with their permanent exhibits, this month features a special exhibit, “My Favorite Things.” For the exhibit, each department chose a natural history piece from storage to put on display. The exhibit by nature is designed to appeal to scientists of all ages and fields in its diversity. Of special interest to oceanographers, “Wild Ocean” is playing at the IMAX theater. Filmed on South Africa’s wild coast, the movie touches on the balance not only between the oceans and people but the relationship between all living things. Showing through March 11, show times are Monday through Saturday 11:00, 1:00, 3:00, and 5:00, with a 9:15 p.m. showing on Friday; and Sunday 1:00, 3:00, and 5:00. We would tell you about the 7 p.m. extra showing this Friday (shhh! ), but instead that’s when Richard Somerville author of the AMS-published book, The Forgiving Air, will give a talk on climate change at the museum.